UN Ambassador Danny Danon discusses failed UN resolution to condemn Hamas. Israel's UN Ambassador Danny Danon said that the failed resolution to condemn Hamas was not a total failure, saying that the very fact that the international body discussed the terror group was a victory. The United Nations General Assembly voted on Thursday against a resolution to condemn the Hamas terrorist organization over its rocket attacks on Israel, its digging of terror tunnels, and launching of incendiary balloons at Israeli communities in the Gaza envelope. "All week, we created a UN discussion on Hamas, all the capitals of the world spoke of denouncing Hamas, and we exposed the face of the organization. 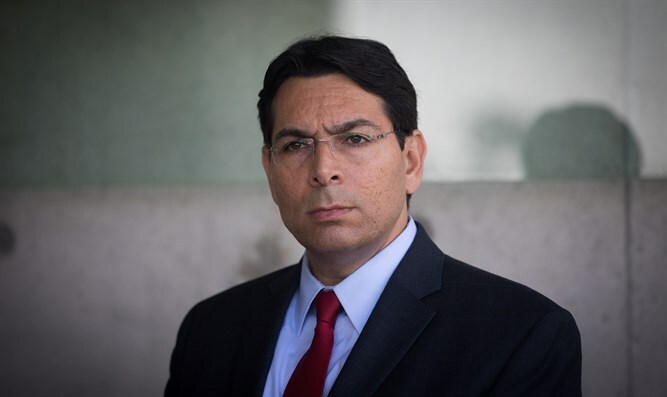 Therefore, as far as we are concerned, the discussion was important and the result is very impressive, with 87 countries supporting the resolution and 33 abstentions, which means that there is an overwhelming majority in the UN that opposes Hamas," Danon told Arutz Sheva. Danon added that "various exercises that are carried out mainly in cases related to Israel prevented the decision from being made, but the message has been clearly conveyed - Hamas is receiving significant condemnation from all over the world and for us this is a very significant achievement." "I think the uniqueness of the decision was that it spoke only of condemnation of Hamas and did not touch the negotiations with the Palestinians and the various accusations we are used to hearing at the UN. We focused on condemning a terrorist organization - and this is a subject that is troubling the entire world," continued Danon. "At the meeting, I said to those countries that decided to support Hamas, and unfortunately there were such things. The day will come when terror will strike you too, and then do not come to complain to the Security Council or the UN that once you support terrorism in Israel, you are backing terrorism all over the world. " Danon alleged that even Arab nations did not want to support Hamas but were forced to oppose the resolution for political reasons. "Many congratulated us on the achievement and on the determined struggle and on the result that was very significant in terms of the numbers we were able to recruit ... There were also Arab ambassadors who voted against the decision publicly and were angry at the activities of the Palestinians who actually defended Hamas," said Danon. "In the United Nations when there is a struggle against Israel - because we are very familiar with the nature of the relations between the sides. Therefore, even Arab countries did not want to support Hamas. " With his term ending in two months, the UN showdown vis a vis Hamas is likely to be his final battle before he returns to Israel. "As far as I am concerned, every day is a day of struggle, and we are already preparing for a new campaign next week - a discussion in the Security Council on the tunnels in the north - when the representative of Lebanon has already issued a letter accusing us of various violations," Danon said. "We will, of course, expose violations by the Lebanese army, Hezbollah's offensive activity in the sector, every day is a day of battle and we are commanded to continue this struggle." Before the vote, the UN voted by a majority of 75 to 72, with 24 abstentions, for a two-thirds majority for the adoption of the US resolution condemning Hamas. As such, even though the resolution received a majority of 87 votes in favor, it was not approved. 57 countries voted against the resolution, and 33 countries abstained. The resolution was one of the final moves being promoted by US Ambassador to the UN Nikki Haley in the United Nations before she leaves office.